Any of your favorite cake recipes can be used for cake in a jar recipes, however, below we have a few favorite combinations to try. 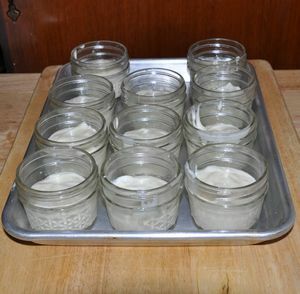 Make your favorite recipe and fill about 11-12 mini jars halfway. I use one scoop from a large muffin scoop. Place on cookie sheet and bake at 350 degrees for 10-15 minutes or until toothpick inserted in middle comes out clean. Allow to cool. Prepare your frosting recipe . You want your frosting to be a little more thin in order for it to be drizzled down the sides of your cake. To make it thinner add a teaspoon of milk or water to your recipe. 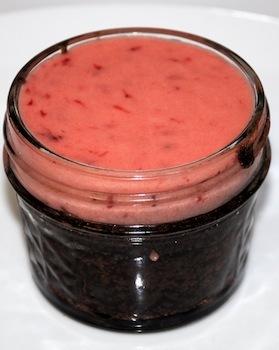 Poke a hole in the middle of your cake in the jar. Pour icing inside the hole and drizzle down the sides. You can leave it as is with the drizzle or decorate the top of your "cupcake" with buttercream such as a swirl with a star tip. Add a lid. Attach a bow if desired. 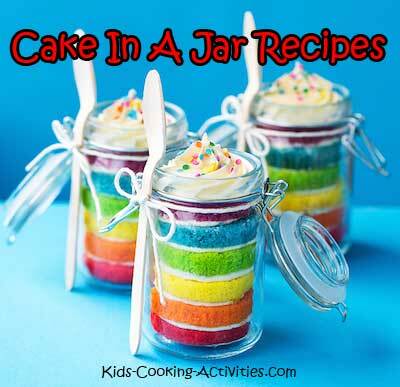 Another fun method for cake in a jar is to bake small cupcakes separately and align them in a jar with layers of frosting.